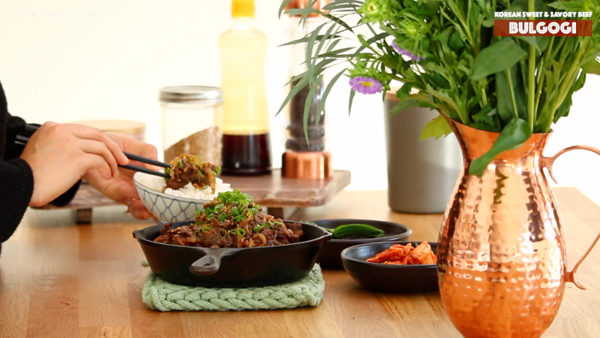 If you have Korean food before or if you love Korean food, you probably know or had at least once Korean Bulgogi. 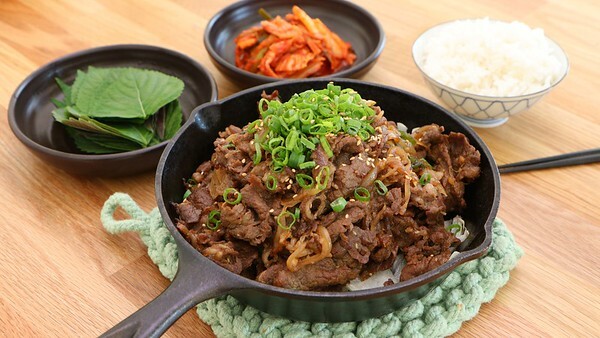 Bulgogi is Korean sweet and savory meat- usually with beef but sometimes with pork too. The main flavor is coming from soy sauce, garlic, fruity sweetness and sesame oil. 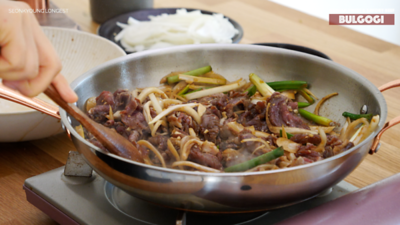 Bulgogi is something that everyone loves, so I always make bulgogi when I introduce Korean food for the first time. 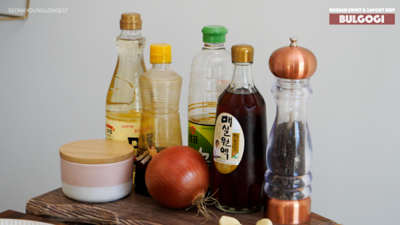 Let’s start making bulgogi marinate & cut veggies! 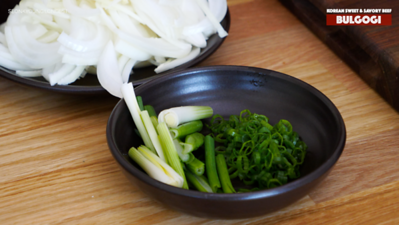 Cut green onions into halves in lengthwise then cut 3/4 from the bottom green onions (from the white to light green part) into 2-inch long pieces. Chopped the rest of the dark green part. 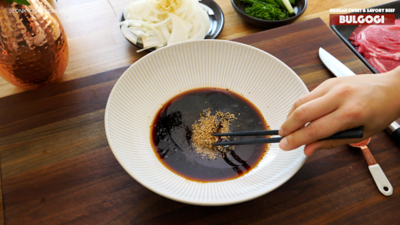 Combine soy sauce, mirin, sugar, plum extract, sesame oil and sesame seeds in a mixing bowl. 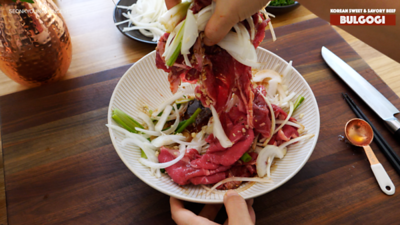 In Korea, we use very thinly sliced ribeye for bulgogi most of the time. 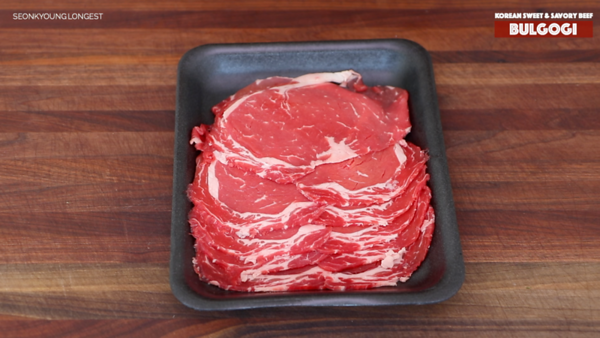 But you can also use beef chuck or skirt steak. 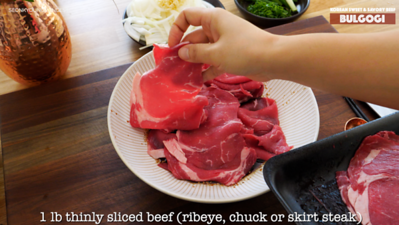 Make sure to slice thinly as you can though- thiner is better for bulgogi! Add beef, half of the onion, garlic, and long strip green onions. 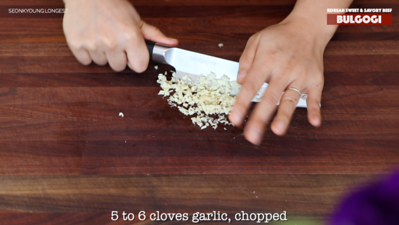 Mix well with your hand and marinate for 30 minutes to over night in a refrigerator. Heat a large skillet over high heat, add 1 1/2 tbsp cooking oil and swirl to coat. 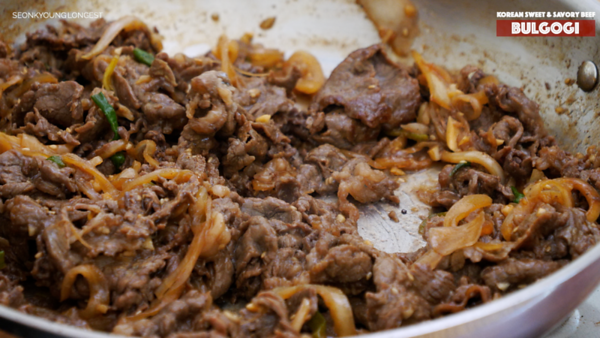 Add marinated beef and cook until beef is fully cooked about 7 to 9 minutes. Stir occasionally. 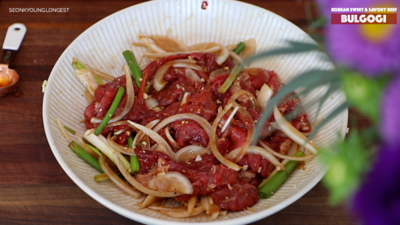 When the beef is fully cooked and the onions are soften, remove from heat. 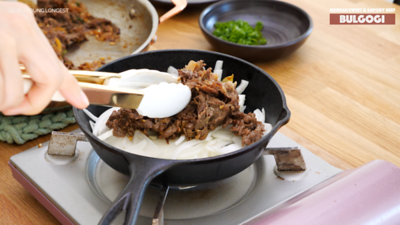 You can serve this bulgogi right away on a serving plate, but if you want to be a little bit fancy, go ahead and bring a small cast iron pan and heat over medium high heat. add 1/2 tbsp of remaining oil and the rest of the sliced onion. 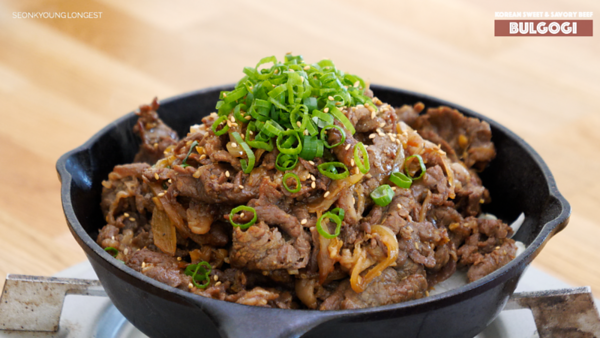 Place bulgogi right on top of the onion. Garnish with sesame seeds, sesame oil and the green onion that we chopped earlier. Serve with warm cooked rice, kimchi and lettuce wrap if you desire! 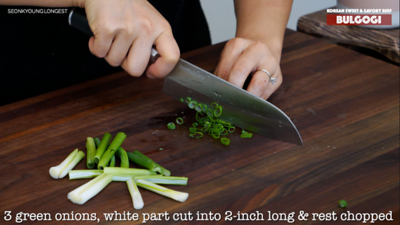 3 green onions, ¾ from the bottom - cut into halves in lengthwise then cut into 2-inch long pieces. Chopped the rest of the dark green part. Add beef, half of the onion, garlic, and long strip green onions. Mix well with your hand and marinate for 30 minutes to over night in a refrigerator. 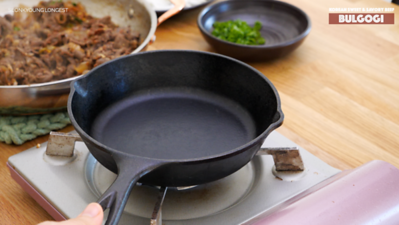 Heat a large skillet over high heat, add 1½ tbsp cooking oil and swirl to coat. Add marinated beef and cook until beef is fully cooked about 7 to 9 minutes. Stir occasionally. Remove from heat. 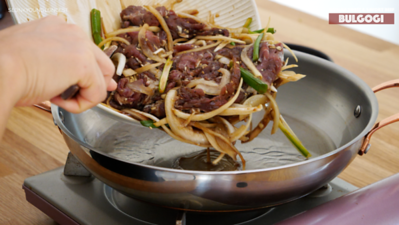 You can serve this bulgogi right away on a serving plate, but if you want to be a little bit fancy, go ahead and bring a small cast iron pan and heat over medium high heat. 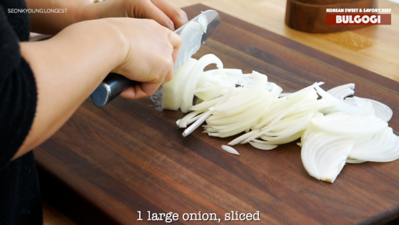 add ½ tbsp of remaining oil and the rest of the sliced onion. 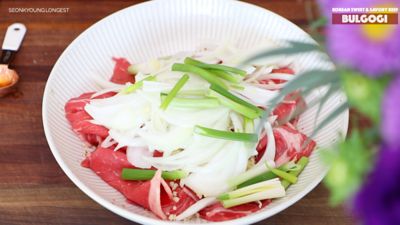 Place bulgogi right on top of the onion and garnish with sesame seeds, sesame oil and the green onion that we chopped earlier. 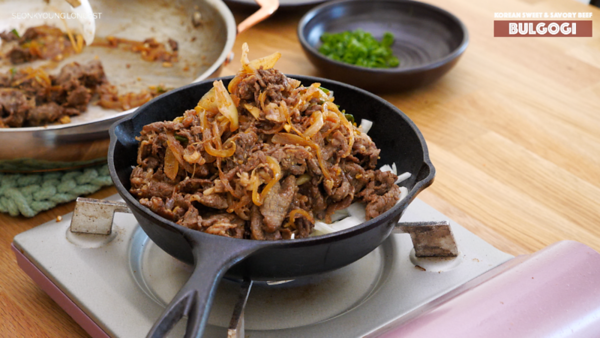 Serve with warm cooked rice, kimchi and lettuce wrap if you desire! Enjoy! This looks delicious, but I wanted to let you know right below the photo of the meat there is an embarrassing typo where it is supposed to say “beef chuck”. Hi, I am a new subscriber and was reading the recipe and notice you have a typo for chuck steak. I know you would want it fixed! This was our first time eating Bulgogi. It was so delicious! I followed the recipe to the letter, and I wouldn’t change a thing. I used a gorgeous sirloin steak, because it was on sale at work. Thank you!